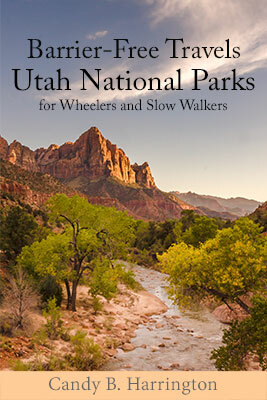 If you’ve ever dreamed of exploring Utah’s magnificent national parks, but thought the rugged landscape might be too much of a challenge because you use a wheelchair or get around a little slower, then pick up a copy of Barrier-Free Travel; Utah National Parks for Wheelers and Slow Walkers, and prepare to hit the road. Penned by accessible travel expert Candy Harrington, this new travel guide highlights accessible trails, sites, and lodging options in Zion, Bryce Canyon, Capitol Reef, Canyonlands and Arches National Parks. And since lodging is limited in the parks, details about 23 accessible lodging options near the parks are also included. And as with all of Harrington’s books, there are lots of photos of the accessible rooms in this title, so travelers can choose the property that best suits their access needs. This inclusive book is the third in a series of accessible travel guides to popular destinations throughout the United States. For more information on this title, as well as information about suggested itineraries and side trips, visit www.barrierfreeutah.com.